That is right! 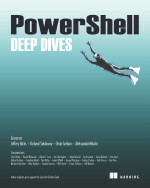 After a lot of hard work, the PowerShell Deep Dives book will be available (Print edition) on 26 July with the e-book available now. As one of the co-authors of this book, I can tell you that not only has this been a challenging task as I did a lot of research into things that I already know just to be sure that I really did know it, but it was also one of the most enjoyable things that I have had the pleasure of doing for the PowerShell community. All proceeds to this book are being donated to the Save The Children charity. So not only are you getting an amazing book filled page to page with some amazing PowerShell content, but you are also contributing to a great cause as well! This is really a great book and one that you should have in your library! Big thanks to Jeffery Hicks for putting all of this together and keeping us all in step to make sure that this became a reality! Hope everyone enjoys this book as much as we did putting it together! This entry was posted in Deep Dive, News, powershell and tagged book, DeepDives, Powershell. Bookmark the permalink.